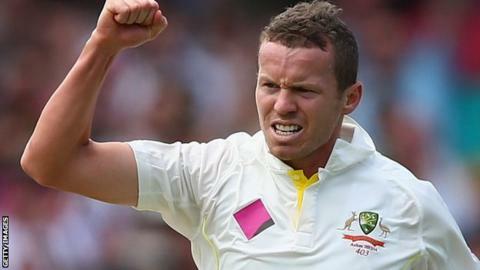 Australia fast bowler Peter Siddle will miss Nottinghamshire's County Championship opener against Lancashire. The arrival of the club's 2014 overseas player has been delayed by visa issues. Siddle, 29, was expected on Wednesday in time for Sunday's match at Trent Bridge, but will now wait for paperwork before completing his trip on Tuesday. "Peter wanted to play, but the speed of the process is out of our hands, which is frustrating," director of cricket Mick Newell told the club website. "Everything that could be done has been done, but we'll get him in the side to face Middlesex at Lord's." Right-arm paceman Siddle helped Australia whitewash England 5-0 in the winter's Ashes series with 16 wickets. The Victorian has taken has claimed 188 Test victims at 29.37, but has not played English county cricket before. His absence means Ajmal Shahzad, Andy Carter or Jake Ball are likely to join Andre Adams, Harry Gurney and Luke Fletcher in the seam attack. Notts rounded off their preparations for the new campaign with a rain-affected draw against Oxford University MCCU at The Parks on Thursday.